This is the 2004 European model YZF-R1 that debuted at the Milano Show of 03. Since its introduction in Europe in 1998, when the YZF-R1 quickly won acclaim as a new standard in the 1000cc supersport class, it has continued to mature and evolve. While maintaining the same basic model character, new technologies and design concepts from our MotoGP machine have helped give birth to a new flagship model that boasts an exciting blend of cornering, performance and styling. These are the new 2004 models introduced in the summer of 2003 for the European market that offer a balance of the joy of true performance riding and convenient functions for daily use in a 600cc middleweight sports bike. 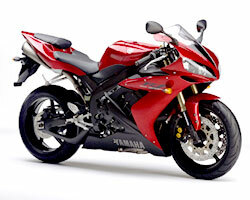 To achieve this, they mount a new power unit that has been developed directly from the supersport YZF-R6 engine. The new main frame is made with Yamahas exclusive CF aluminum die casting technology enables a combination of weight reduction, fresh new styling and high-level performance. The bore x stroke, the shape of the combustion chamber, the forged pistons, the intake/exhaust valves, the crank shaft and cylinders are all the same as those of the YZF-R6 engine, while the intake and exhaust system specs have been optimized to achieve the good low- to mid-speed range characteristics that riders want in an all-rounder. The fuel injection system adopted is a so-called group injection type that provides great reliability and simplicity at the same time. Other features include a 4-into-2-into-1 up-muffler, optimized front-rear weight distribution (front 51%), a long rear arm, same diameter front fork as the FZS1000, new tire sizes and the same lightweight wheels as the YZF-R6. The combined effect of these improvements is a whole new level of performance. 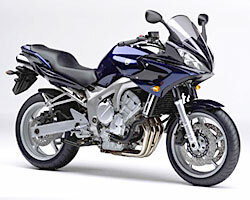 The designs for the cowling-fitted Fazer and the naked model FZ6 were developed simultaneously. The result is unique styling that would not have been possible with a simple naked variation of a model designed originally for cowling. What's more, the front fenders and seat cowl have been given a new metallic color finish that gives these parts a greater sense of depth and quality.